For a long time the native Maori people of New Zealand have included the New Zealand Green-Lipped Mussel as a staple part in their diet. This unique mussel is known scientifically as “Perna canaliculus”. For centuries, it has provided an excellent source of protein, vitamins, minerals and extremely valuable omega-3 fatty acids. Maoris could be seen at Auckland’s seafood shops before dawn buying their mussels before going to work. For more than twenty years freeze-dried concentrated mussel powder has been used as a natural food supplement for the prevention of pain normally associated with older individuals experiencing joint discomfort. Following fifteen years of international scientific research by independent scientists from the Royal Melbourne Institute of Technology University, the goal of identifying the principal components responsible for the extract’s high potency was achieved and named Lyprinol®. Most mussel powders over the years have shown conflicting results in efficacy studies due to the oxidation of their non-polar lipids (Lyprinol®), which is where their true activity lies. 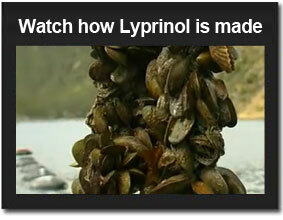 Lyprinol® is a unique marine lipid group comprising a unique combination of different non-polar lipid groups and omega-3 polyunsaturated fatty acids which are extracted from the New Zealand green lipped mussel, Perna canaliculus, by way of a supercritical fluid extraction process using liquified CO2. Many scientists and government institutions around the world agree that the average western diet is very high in another group of fatty acids, namely omega-6. As a result our cell membranes are unusually rich in precursors associated with inflammatory processes which can lead to arthritis, psoriasis and asthma, to name a few. The anti-inflammatory properties of Lyprinol® have been examined by research scientists at RMIT University, Adelaide University & the University Of Queensland. 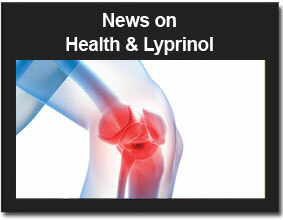 According to this research, Lyprinol® is an effective anti-inflammatory agent (Dr. Whitehouse). Lyprinol® is an inhibitor of the 5 – lipoxygenase (5 – LOX) pathway and that this inhibition can at least be traced to the fatty acids in Lyprinol®. The unique grouping of omega fatty acids in Lyprinol® are potent inhibitors of the lipoxygenase pathway, which is where leukotrienes are produced. This is one reason why it is believed that individuals with diets rich in high potency omega-3 lipids seem to have less joint discomfort as they age. In recent years interest has increased regarding lipid compounds, which have evolved as valuable nutritional substances. One group of these are the polyunsaturated fatty acids (PUFAs). These fatty acids are named by identifying the number of carbon atoms in their molecule and indicating the number of their double or unsaturated bonds. For instance scientists call a PUFA with eighteen carbons and three double bonds as 18:3. Some well-known sources of PUFAs are the unsaturated cooking oils such as sunflower, canola and soybean oil. Fish oils, which have been researched for their ability to reduce cholesterol and improve health of the heart and circulatory system also contain PUFAs. Two basic categories of PUFAs, which have received a lot of attention relative to human nutrition are the omega-6 and omega-3 PUFAs. Omega-6 PUFA’s are contained in all vegetable oils. Omega-6’s are almost totally made up of linoleic acid (18:2) and its derivatives. Some of the omega-6 are considered more valuable, such as GLA (gamma linolenic acid, 18:3) found in evening primrose and borage oils. Omega-3’s are found to a limited degree in some plants but are contained in all fish and shellfish. For instance, canola and flax oils contain alpha linolenic acid (18:3). The omega-3 PUFAs contained in fish are considered to be five to ten times more powerful in their biological activity than those found in plants. It is acknowledged by the medical fraternity around the world that the western diet provides more omega-6 PUFAs than omega-3 PUFAs. This leads to our cellular membranes becoming rich in omega-6’s such as arachidonic acid. This acid is a precursor to certain molecules that can cause inflammatory processes associated with arthritis, psoriasis and asthma to name a few. Many studies have reported that certain lipids from fish and other marine sources can have a beneficial effect on our overall health when they should be part of our diet on a routine basis. 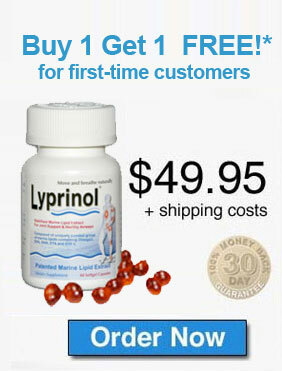 After much clinical research, and double-blind studies, there is little doubt that Lyprinol® can provide a potent means of controlling and inhibiting the damage caused by the excesses of the body’s inflammatory responses. These findings prompted a series of further studies to compare Lyprinol® with other health food products claiming anti-arthritic properties. Lyprinol® was compared with Flax Oil, Evening Primrose Oil, Salmon Oil and Max EPA (fish oil) in the adjuvant induced poly arthritis test system (Studies Whitehouse – Inflammopharmacology 1+2). 200 times more potent than Flax Oil in controlling the joint swelling associated with arthritis. The unique grouping of fatty acids in Lyprinol® has evolved as the most potent group of Omega-3 lipids in blocking the 5 – lipoxygenase metabolic pathway responsible for inflammation in the body.